Running | Joseph P. Fisher, Ph.D.
To hear his parents tell it, Joe’s running career began somewhere around age 5, when he would go to the backyard of his family’s home in Brockton, Massachusetts and would run in circles with their dog Princess until the two of them would simply fall over. This might not have been the most auspicious start to things, but it was certainly a thrilling one. That backyard felt huge. About 6 years later, after a few family moves up and down the East Coast, Joe’s parents encouraged him to join his middle school cross country team, which he did when he was in the sixth grade. That moment marked the beginning of a lifelong running career—both competitive and recreational. As a high school athlete, Joe ran cross country, indoor track, and outdoor track for St. John’s High School in Shrewsbury, Massachusetts. From 1991-1995, St. John’s running teams, collectively, strung together a perfect record of District E Conference championships. In late December of 1992, Joe won his first and only race at the District E Freshman-Sophomore indoor track meet at South High School in Worcester, Massachusetts. For one brief moment, and from an extremely technical perspective, Joe was once the top high school underclass indoor mile runner in the district. Joe was a Division II cross country runner for his four years at Saint Anselm College in Manchester, New Hampshire. During that time, he also majored in English and began a disciplined regimen of scholarly work that would carry him through the completion of his Ph.D. In 2007. After graduating from college, he took a break from competitive running to focus on his education. Upon the completion of his graduate work, Joe made a slow return to competitive running, focusing initially on the ten-mile distance and ultimately progressing to half and full marathons. He has been a member of DC Road Runners since late 2010, and he has worked closely with coach Wilson Komen since 2011. Joe is a three-time Boston Marathon qualifier. In his thirties, he set personal records in the ten-mile, half marathon, and marathon distances at 1:00:03, 1:20:33, and 3:04:17. His goal is to break all of these records in his forties. Every so often, he writes about this pursuit, and the inevitable frustrations associated with it, on his personal blog. In late 2015, Wilson Komen asked Joe to serve as the communications director for his coaching company, Coach Kiprunning. In this capacity, Joe has served as Wilson’s webmaster, social media director, and as the lead writer and editor of the Coach Kiprunning Blog. Joe is also the author and developer of the Kiprunning Route Report , a free online guide to a variety of DC, Maryland, and Virginia running trails. Read it, and bookmark it widely! 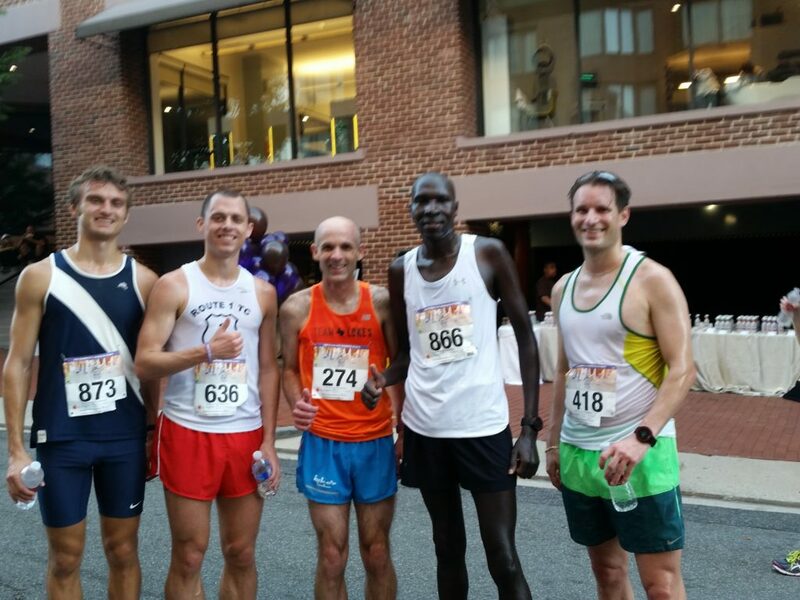 Joe is an RRCA certified running coach, and he is currently working with Coach Komen to develop the Kiprunning Sports Club, a competitive running team that they hope will eventually compete with some of the DC-area’s top running groups. In his 35 years of running experience—stretching all the way back to those collapses in Brockton—Joe has felt the ecstatic joys of races well run and the deep heartache of setbacks and injury, not to mention a good amount of everything between those two poles. Though he did not always know it—and sometimes did not even want it to be so—running is his lifestyle. Parents, it seems, do often know their children better than they know themselves. Spouses, likewise, through their undying patience and love, offer unparalleled encouragement in both good times and in bad.